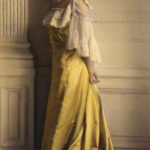 Alice Roosevelt Longworth was an American writer and prominent socialite. She was the eldest child of U.S President Theodore Roosevelt and the only child of Roosevelt and his first wife, Alice Hathaway Lee. Alice led an unconventional and controversial life. Her marriage to Representative Nicholas Longworth III (Republican-Ohio), a party leader and 38th Speaker of the U.S House of Representatives, was shaky, and her only child Paulina was allegedly a result of her affair with Senator William Edgar Borah of Idaho. She was a Democrat during the Kennedy and Johnson administrations. "I have a simple philosophy: Fill what’s empty. Empty what’s full. Scratch where it itches." "My father always wanted to be the corpse at every funeral, the bride at every wedding and the baby at every christening."